Recently purchased driver and 4 wood to replace older version. Quality of workmanship is excellent. I have tried steel but really prefer the look and feel of the wood. Very satisfying to hear the 'click' when the ball makes contact. Consistency is wonderful which translates to lower scores. These clubs bring back some tradition to my game. I have much more control and distance is still pretty good with the average drive being around 260 yards down the middle where I want it. 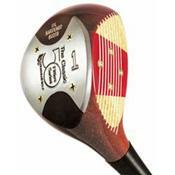 The 4 wood literally lifts the ball off of the fairway with great trajectory. I thought I wanted a Ginty but the good folks at Louisville talked me into the niblic. Great choice. I had no problem getting the correct shaft and length with the grips that I wanted. I am very happy with these clubs. How can anyone complain about the price, $169.00, when compared to the latest offerings from other manufacturers. Of course I get a great deal of ribbing from my buddies but I still collect the cash! Very good. When you talk to Louisville you talk to the owners who play their own clubs and know how they perform. 25 year old Louisville woods.